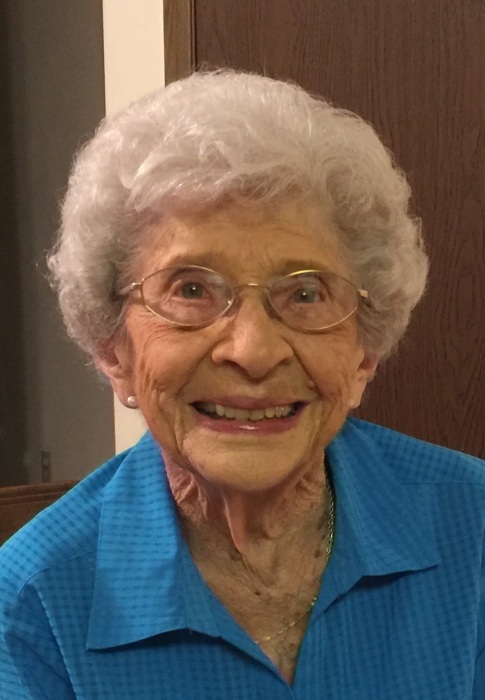 Eileen I. Bowerman, age 97, of Delta, passed away the morning of Memorial Day, May 28, 2018 at the Fulton County Health Center in Wauseon. She was born in Napoleon on September 25, 1920 to the late Elmer Spiess and Mary (Mohler) Spiess. Eileen was a 1938 graduate of Liberty Center High School. She later married James Bowerman and he preceded her in death in 1972. For over 20 years Eileen served with First Federal Bank in Delta. One of her favorite hobbies was reading. Along with her husband, James, she was preceded in death by her son, Jack Bowerman in 2017 and brother, Duane Spiess. Eileen is survived by her son, Tony (Holly) Bowerman on Bowling Green, OH; grandchildren, Betsy (Jarod) Stewart, Libby Bowerman, Brett Bowerman, Lindsay Bowerman and Brook (Helley) Bowerman; great grandchildren, Avery, Ashton, Graham, Faith and Henry and daughter-in-law, Sue Bowerman. Friends will be received from 10:00 AM – 11:00 AM on Thursday, May 31, 2018 at Barnes Funeral Chapel, 5825 St Hwy 109 in Delta; where a funeral service honoring Eileen’s life will begin at 11:00 AM on Thursday also at the funeral home. Rev. Teresa Wenrick will be officiating. Interment will follow at Greenlawn Cemetery in Delta. In lieu of flowers, those wishing a show of sympathy are asked to consider contributions to the Delta United Methodist Church, 101 Northwood Dr., Delta, Ohio 43515 or the Delta Library, 402 Main St, Delta, Ohio 43515 in her memory. Online condolences may be sent to the family through our website at www.barnesfuneralchapel.com.